Sentix conducts investor surveys in Europe. Usually, it is the sentiment survey that draws attention. It will be reported next wee. Since 2012, it has been asking specific questions about the risk that monetary union breaks up. The latest results show that 17.5% of investors expect the eurozone disintegrate within the next 12 months. It has risen from 15.7% in August but is below the 20.3% in July (following the UK referendum). What draws attention today is Sentix post that shows a change in risk perceptions. 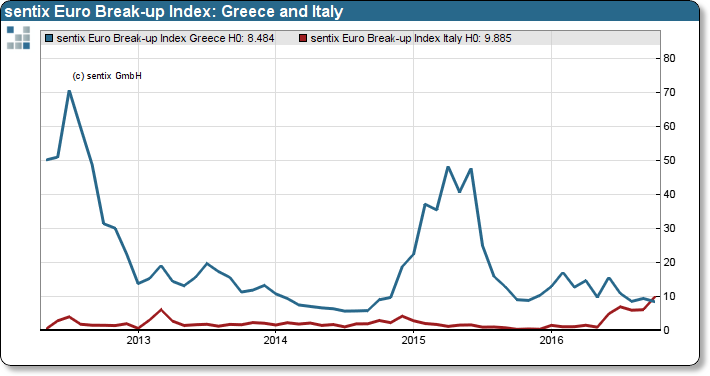 As this Great Graphic illustrates, investors attribute a higher risk to Italy leaving the EMU than Greece. 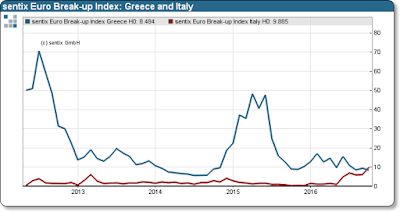 Moreover, it is not a spike, but a gradual increase in the risk that Italy leaves, while the risk that Greece leaves are stable after easing near midyear. According to the Sentix, a survey of more than a thousand investors 9.9% think Italy leaves within a year. In comparison 8.5% expect Greece to leave. The next three candidates for departure are Portugal (3.5%), Finland (2.9%) and France (1.5%). Investors have several concerns about Italy. Earlier the banking system, the non-performing loans, and the need for new capital weighed on sentiment. More recently, the referendum next month on changing the perfect bicameralism by stripping the Senate of its powers and members, upon which Renzi had initially tied his tenure, has emerged as the chief threat what passes for political stability in a country with its third unelected prime ministers. The effort to weaken the Senate is the second prong of Renzi's political reform agenda. This first prong is called the Italicum, and it was approved by referendum in the Spring. It will make is easier for the party with the most seats in the Chamber of Deputies to govern by giving it bonus seats (shades of Greece?). It seems that this effort assumed the success of the referendum to change the de-fang the Senate. This seems less likely now. All the main opposition parties and many newspapers have declared their opposition. Though polls mostly show the no's ahead, the lead is not large (3-5 percentage points) and there are still a high number of undecided people. Although Renzi has already backtracked from his threat to resign if the referendum is rejected, it is still seen as a blow to him personally and the reform efforts. At the very least, a defeat would mark the end, many think, to Renzi's reform efforts, which had concentrated on political reforms when his brief effort at economic reforms was effectively blocked. A defeat could spur a cabinet reshuffle. Should the Senate not be reformed, the Italicum would need to be modified before parliamentary elections that are currently slated for 2018. It will likely be the subject of next year's political focus, assuming Renzi does not resign. This suggests that if the referendum is defeated, the political reform efforts will be redirected toward the Italicum. Lastly, earthquakes and aftershocks in Italy come at an opportune time, if such a thing is possible. Italy's fight with the EC over the annual budget has begun. While there is flexibility on fiscal policy to meet extraordinary challenges like the refugee crisis and the earthquakes, the EC is reportedly requesting specifics the anticipated earthquake relief expenditures. That level of detail seems unusual for a country that is not in a support program. Renzi is unlikely to lose a single vote for taking on the EC, but whether it will be sufficient to widen his base or overcome fears that the reforms will give the next prime minister too much power. The underlying concern is that the second largest party in Italy (the 5-Star Movement) is hostile toward EMU and may be best positioned to capitalize on a weaker Renzi or fissures in Renzi's PD party.